We finally broke out our "At the Pond" theme from Mother Goose Time and day 1 was all about turtles. The first activity from each month is always the name tag. So I got them out, cut them apart and asked which animal each of them wanted. Adam chose the frog. I wrote his name on it in yellow and then gave him a blue pen to try to follow the yellow lines. He has really gotten better at this concept and we have been practicing with our Muscle Mover cards from Fundanoodle. The next brilliant step to the name tags was to place a bean on each letter. First we discussed what a turtle might eat, which we discovered was algae, insects, crawfish, fish, tadpoles and even frogs. So he snapped up a piece of "turtle food", also known as beans, and put them on each letter of his name. 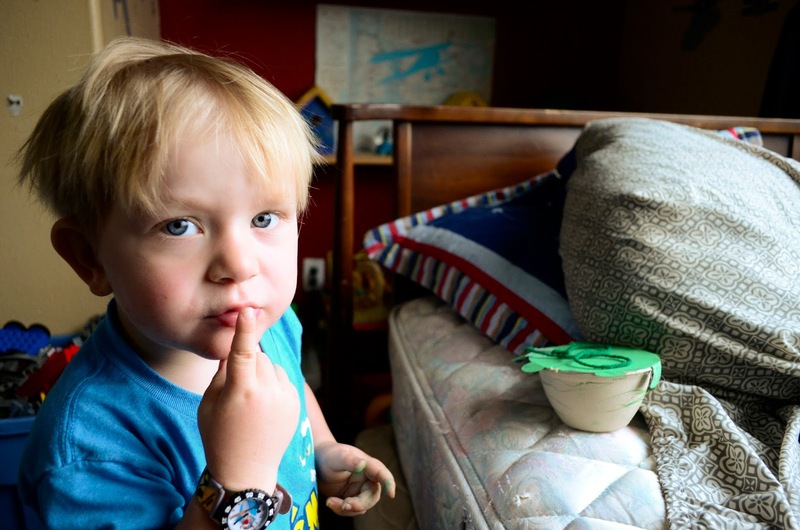 He used tweezers to refine his fine motor skills. Which, at 3, are pretty stellar. We have been practicing the one to one correspondence concept quite a bit lately. Whenever we are counting, instead of just letting him count as high as he can as fast as he can, I try to get him to associate it with something. We counted our steps as we went down stairs yesterday and I exaggerated my stepping and my counting. If he got ahead of the actual step we were on we went back. When we counted out beans for each letter of his name he was spot on, 4. I always like to take a step back and take a picture of the big mess. I am pretty darn good at cropping pictures to cut out all the chaos, but I want all of you to know the truth of what's really going on around me. We are eating, we are doing school, we are shirtless, we are face painted, there is garbage and a lot of last minute preparation going on. Now this is the part of the story where we meet our turtle friends. But first, we had to create them. Realizing Adam may not have much experience with turtles, I found videos of turtles on YouTube. 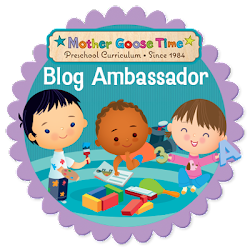 Specifically of turtles bringing their heads in and out of their shells because this is what Mother Goose Time recommended to do as our discussion as we worked. That's what I love about MGT, it's not just a craft, but a full discussion and learning process as we craft. Adam helped me get the glue on and place each eye right where it was supposed to go. Lachlan, who is 8, followed the pattern on the shell of one of the turtles we saw in the videos. Peter never sits upright in a chair for long and when he was down Lachlan put a shell on his back. 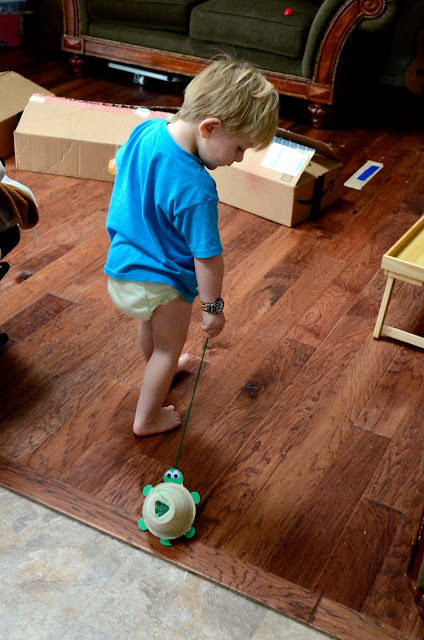 This is Adam's pet turtle named Turtle, going for his first walk. 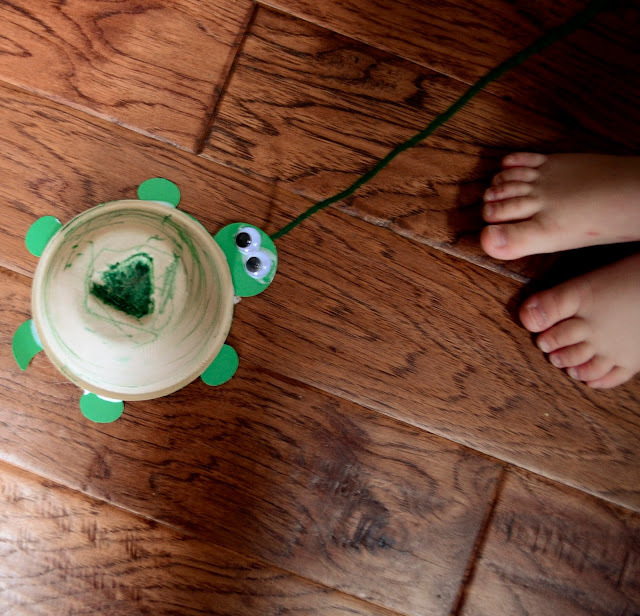 I love the little toes with his pet turtle. 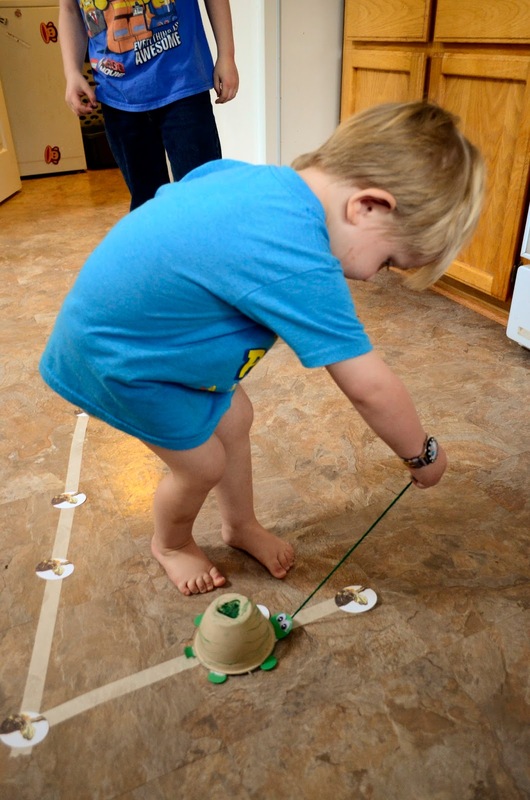 Lachlan folded the arms and legs of his turtle underneath so that he had the ability to hide. While Adam was still making his turtle I gave Lachlan the job of putting a large number 7 on the kitchen floor with masking tape. The Patient Turtle activity was designed to help introduce us to the number 7 which is one of our numbers we are learning this month. We talked about how slow a turtle moves and we were supposed to crawl slowly along the 7. But since the turtle pets were so special to us and going along with us everywhere we went, I decided to have Adam move his pet turtle along the 7. We were also given turtle egg cards that they could carry on their backs from one end of the 7 to the other. But I simplified things a bit and made it fit Adam by laying out 7 turtle egg cards on the number 7 and we slowly walked along and counted by tapping our toes on each egg as we went. At that point Adam and Turtle went on their way to have many more adventures. But poor Turtle did get tired, so Adam laid him down for a nap. You can see him proudly showing me where he put Turtle to sleep, on the messy torn apart bed. But Turtle didn't mind. Shh . . . be quiet, Turtle is sleeping. After Turtle's nap he needed some more food. We cut a small hole in the bottom of him so he could be fed. Adam with his new spoon he got for his birthday. :) I mean, what better gift for a 3 year old! He even got his own set of tongs. He really enjoyed feeding Turtle. Eventually he just flipped him over and put the beans in. Turtle and Shelley have been well "loved" and do not resemble a turtle quite so much these days. But I absolutely love these moments with Mother Goose Time - when their imaginations are unlocked and simple paper is transformed. 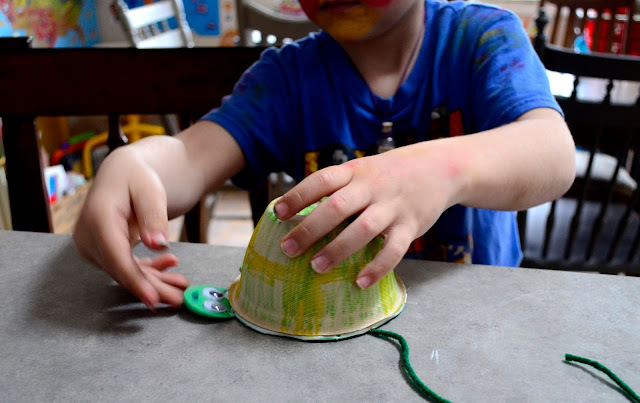 Each Make and Play craft has a purpose. I love the balance of process driven art and arts and crafts with more structure that end up being a treasured pet. It's heartwarming to see you enjoying the little moments with your boys while also being transparent about the daily life messes! I just received our first MGT kit, which is Pond Life, so I've really found your blog helpful! Thanks Holly, that's always my dream, to encourage others to enjoy these treasured moments and be real about what a day looks like around here. It doesn't have to be picture perfect to spend time learning together.